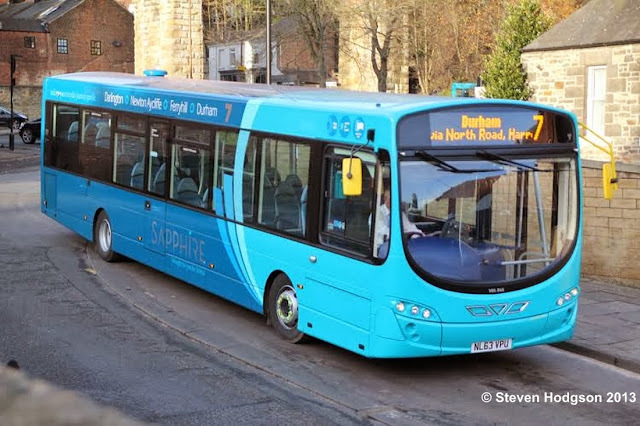 Arriva have brought their Sapphire brand to the north east by launching a route between Darlington and Durham. Steven Hodgson has sent pictures of the new Wright VDL vehicles in action. The Sapphire brand has been used successfully elsewhere in the UK and the originally it was intended to launch in the north east in October. Then Minister for Transport, Norman Baker visited Darlington at a pre-launch day but only now have the new vehicles become available. Arriva's press material is shown below. Arriva’s new Premium bus service, Sapphire, will see 10 new single deck buses provide an exciting customer experience for bus passengers on the popular No. 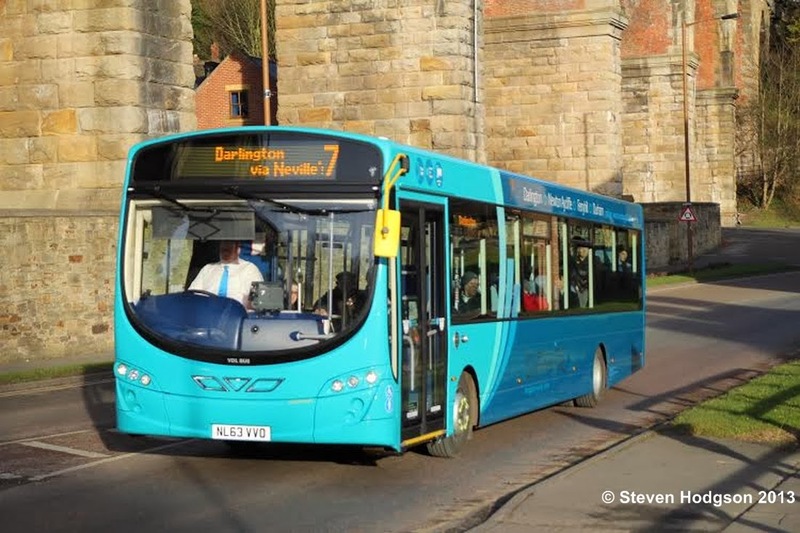 7 route between Darlington and Durham. The service will include features such as; free on board wi-fi, electric charging points for phones, iPads and laptops, audio-visual stop announcements and luxury seats with extra leg room. To celebrate the Sapphire announcement Arriva rolled out the blue carpet for passengers to come and have a look around a double deck demonstrator bus in the Horsemarket. The new Sapphire buses represent a £1.5 million investment in the area on behalf of Arriva and come hot on the heels of the introduction of 11 new Gas Buses to the town. 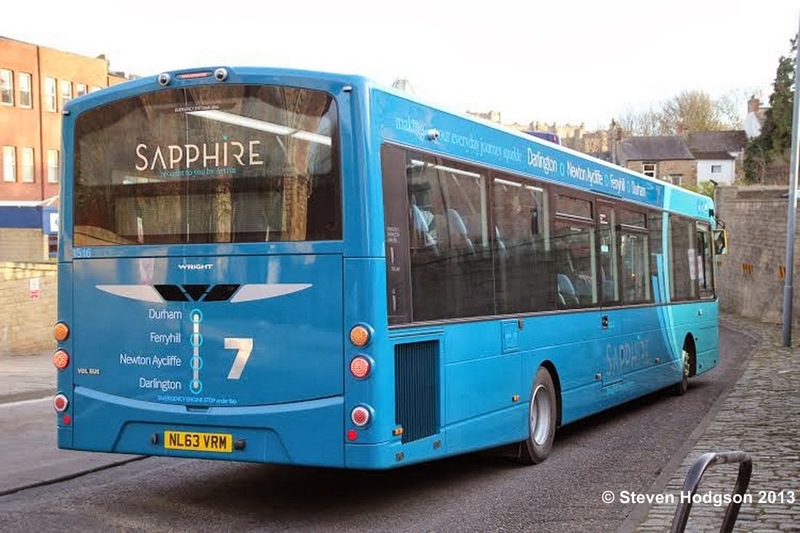 Nigel Featham, regional managing director for Arriva North East, said: “We’re delighted to be bringing the Sapphire brand to Darlington and Durham, to operate on our Route 7 service. It will certainly offer our customers something different and we hope will tempt more people to try the bus as a result. “We felt the time was right to introduce the Sapphire brand. It will certainly offer our customers something different and we hope will tempt more people to try the bus as a result. “The investment is significant at a time when there are plenty of economic challenges out there, although we firmly believe in continuing to try and improve our service offering whenever and wherever we can."